Fritz Vahrenholt is a distinguished German politician (SPD) who gained a doctorate in chemistry in Münster, and started his professional career at the environmental protection agency in Berlin, and the Ministry of the Environment of Hesse. He has spent much of his career campaigning on environmental issues. In 1998 he joined the energy industry, and until 2001 was on the Board of Deutsche Shell AG, a Shell subsidiary. In 2001 he moved to post of CEO of the wind turbine company REpower Systems AG and remained there until 2007. From February 2008 he was CEO of electric power company RWE subsidiary RWE Innogy. In 1999 he was made an Honorary Professor of chemistry at the University of Hamburg. Vahrenholt was for years a true believer in climate alarmism — until he read “The Hockey Stick Illusion”. He is now a convinced sceptic, and recently collaborated with colleague Dr. Sebastian Lüning to write a new book “The Cold Sun: Why the Climate Crisis Isn’t Happening”, currently only available in German, but scheduled for publication in English later this year. The IPCC admits that current levels of CO2 are insufficient to explain the 1980/1998 warming, so they look for “amplifiers” and positive feed-backs that would increase the impact of CO2 warming. Vahrenholt and Lüning believe that the Sun, rather than CO2 amplifiers, is responsible. Vahrenholt and Lüning are coming to the European parliament next month, where they will present their findings. But we were privileged to have Dr. Lüning address the Heartland Climate Conference in Chicago on Wednesday. He was the last speaker of the three days, and any attendees who had chosen to leave early missed a treat. I have always argued that “the small changes we have seen in mean global temperatures in the last hundred years are entirely consistent with well-established, long-term, natural climate cycles”. 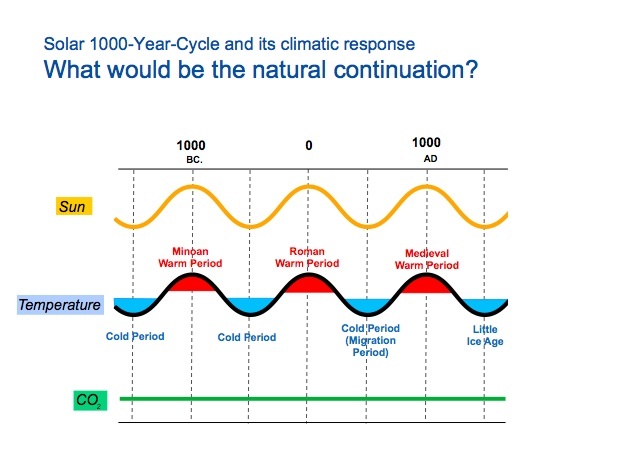 Lüning made the same point, describing the Bond Climate Cycles, which happen every 1000 years plus, and gave us the Roman Optimum, the Dark Ages, the Mediaeval Warm Period and the Little Ice Age, and now appear to be taking us into a new 21st Century optimum — for which we should all be very grateful. This is covered in some detail in Professor Fred Singer’s book “Unstoppable Global Warming — every 1500 years”. Superimposed on that is the Sun’s eleven-year sunspot cycle, which itself has phases of greater or lesser amplitude. It appears that the Dalton and Maunder Minima, which wrought havoc with the climate and human welfare during the Little Ice Age, were associated with very low sunspot activity. Many astronomers believe that we are entering a new “Cold Sun” period, in which case global cooling may be a bigger threat than global warming. The mechanism appears to be that the solar wind affects the cosmic ray flux in the Earth’s upper atmosphere. Cosmic rays promote cloud formation. More solar activity, fewer cosmic rays, fewer clouds, lower albedo, global warming. Dr. Lüning presented graphs showing a remarkably high level of correlation not only between solar activity and global temperature, but also with other variables like the size of lakes and the flow-rate of rivers. The close relationship is beyond doubt. And unlike Al Gore’s relation between CO2 levels and temperature, the causation can only be one way. No one will believe that the flow of rivers causes the sun to change. Astronomer William Herschel discovered a couple of hundred years ago a correlation between sunspot activity and the price of grain, and was roundly derided for it. But now that we know that the Sun affects the climate, it is perfectly plausible that it would affect the price of grain. (Gore’s error was to assume that CO2 causes warming, when in fact warming increases atmospheric CO2, as a result of out-gassing from the oceans. The oceans contain roughly fifty times more CO2 than the atmosphere). The Good Book says that there is joy in heaven over one sinner that repenteth. Certainly a life-time-green who finally recognises the error of his ways is a powerful message to the rest, and we’ve had several. Goerge Monbiot embraces nuclear power. James Lovelock, the Gaia Guru, says “Twenty years ago we knew what was happening to the climate — but now we don’t”. And now Fritz Vahrenholt agrees that climate change is caused primarily by the Sun (plus a range of other complex factors) rather than CO2. I’m looking forward to hearing Fritz and Sebastian next month in Brux — and to reading the book. Great! Common sense beckons, but will politicos in charge resist or ignore it? Maybe committed too much, with taxes and speeches and Ministries of climate change to turn back: not a good testimony to flexibility and nous! What would be the mean temperature of Earth without the radiation of the sun? What would happen if every day the sun radiated Earth’s surface evenly, from pole to pole? What kind of climate would Earth feature rotating around the sun at 1/100th the speed? . There are so many simple explanations for climate change, excluding the accusations of Gore and others, that the oversights should boggle the mind of rational, intelligent humans. Maniacal and egotistical it is for climate alarmists to incessantly pin the half-empty portion of the glass on human activity. CO2 should never be an issue, but for the man’s love of money and power. We must end crisis construction. This is just the sort of thing which we needed to hear ten years ago. I visited my warmist daughter and her “partner” and, at one stage, caught them secretly holding hands in front of a huge TV screen in Australia, upon which was being played some propaganda about global warming. They were entranced: it might have been a Church Service. I asked my nephew what he thought. He just looked at me and said, sceptically,”I am a geologist.” Actually he is. I still dare not forward the article above though!